A carafe shaped device that removes impurities from drinking water using a carbon block filter. 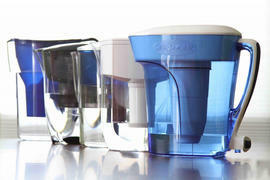 Pitcher water filters reduce lead and other contaminants. The amount of water they can hold is limited to 10 cups. Filters need to be replaced regularly. Pitcher water filters are the most economical type of filter, generally running between $20 and $50.